The Kipling® brand designs every product to inspire moments of happiness. Guided by the mantra “Make Happy,” the brand often turns to the wholehearted joy of children for its inspiration. In 2016, the Kipling® team in Hong Kong learned about the Steung Meanchey community from the nonprofit Cambodia Children’s Fund (CCF). For years, this neighborhood outside Phnom Penh was a dumpsite for chemical and industrial waste, making it one of the largest garbage dumps in Southeast Asia and one of the most toxic and dangerous environments in the world. Although dumping stopped in 2009, Steung Meanchey remains home to some of the region’s poorest communities, including hundreds of children, many of whom cannot afford to go to school. 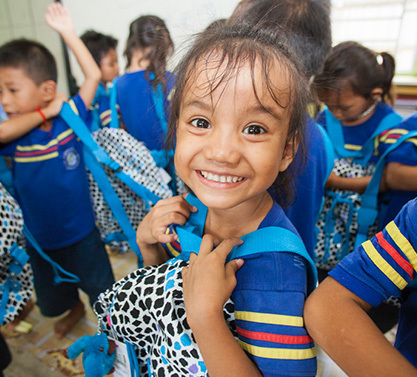 The Kipling® brand was motivated to help CCF, whose mission is to use education as a pathway out of poverty, by providing backpacks manufactured at a supplier facility in Phnom Penh. In April and May 2016, for every bag sold in its Hong Kong stores, the Kipling® brand donated a backpack to a child in CCF's care in Steung Meanchey. Nearly 3,000 bags were donated along with notes written by consumers to the children receiving a backpack. After seeing the positive impact their actions could have on these children, Kipling® brand associates were eager to identify ways to continue their support. The brand’s associates committed to sponsor 10 students to pay for their full university education. In addition, Kipling® brand associates introduced a Career Mentorship Program to CCF, providing career guidance and advice to students who were enrolled in university. The success of this partnership has led other VF brands with sourcing factories in Phnom Penh to explore opportunities for involvement in similar programs, creating the potential for exponential, positive impacts for the community of Steung Meanchey.